The CIT Program is designed for former campers who are 18 years of age and who would like to be considered for a Camp Rising Sun staff position in the future. The purpose of this program is twofold: to give the CIT an opportunity to learn the duties of a counselor as they transition from being a camper and to give the CRS director team a chance to evaluate leadership skills. Participants in the program are not guaranteed to be offered a future position. CITs will develop into potential future CRS staff by experiencing cabin life and learning the importance of the role of a CRS staff person. Taking initiative, relating well to staff and campers, respecting camp property, observing camp rules, and demonstrating leadership abilities are some of the traits that we would like to be developed. These same traits are some of the criteria used to accept staff to a future position. CITs must follow the rule of three and all other rules outlined in the camp handbook. CITs must be 18 by or on the first day of camp. Any former campers who turn 18 on or before the first day Camp Week may NOT attend Mini Camp Weekend. Former campers who are 18 by camp may only attend camp as a CIT. Campers planning on applying to the CIT program are advised to not attend Mini Camp Weekend the year of their 18th birthday (the year they are eligible to be a CIT) to provide a buffer between being a camper and a counselor. CITs must arrive at 8 a.m. on Sunday, the first day of camp. CITs must complete all the same paperwork required for staff, including obtaining a medical form from a physical done within the prior 24 months of camp. CITs will have daily duties. They will rotate working between cabins (Cabins 1, 2, 3, 4, 5, and 7) and Program, with the exact rotations dependent on the needs for that particular day. CITs will lodge in a designated CIT cabin. They will be expected to wake and arrive to their assigned cabins before breakfast to assist in preparing the campers for their day. They will eat all meals with the assigned cabin. They will act and be treated as a counselor during the day and will spend the entire day with their assigned cabin. 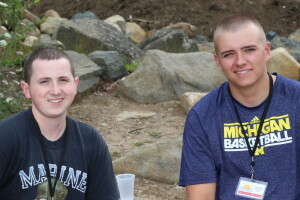 They will assist the campers and other counselors at assigned activities until the campers are all sleeping, at which point the CITs are considered released for the night. At that time CITs are expected to return to the CIT cabin for a debriefing with the CIT staff.